After several days of “let’s make latkes out of anything” including lasagna and mac and cheese, it was time for some “normal” latkes. But not quite normal; parsnips and potatoes are a great combination, so why not potato and parsnip latkes? Parsnips add a nice sweetness that added interest to the latke. It was another reason to go grab some parsnips from my basement refrigerator! There are still 5 – 10 lbs left from my harvest. 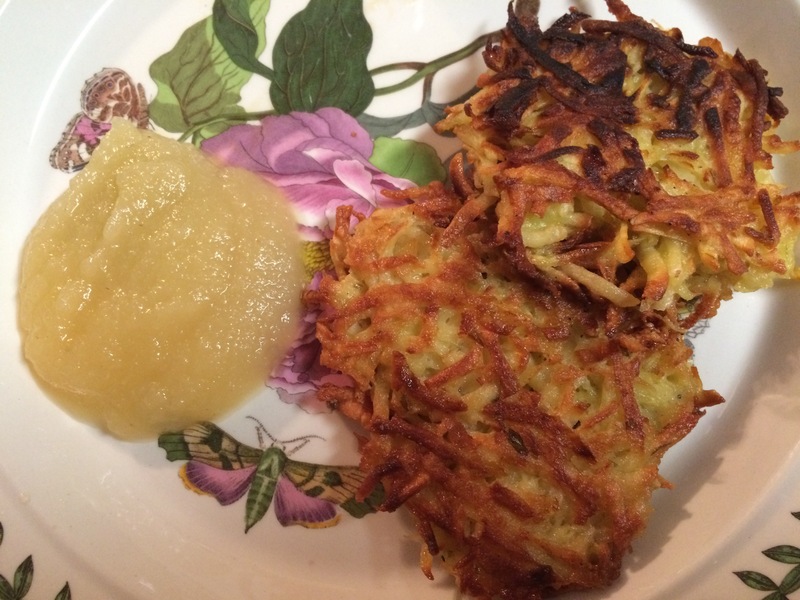 These latkes definitely go well with applesauce. The original recipe does include a recipe for cinnamon apple sauce, but I did not have the time, so I must admit I used pre-made. The latkes were still wonderful with them. Grate the potatoes, parsnips and onion using the medium grater attachment of a food processor or the large holes of a box grater. Squeeze the mixture by the handful over the sink to remove any excess liquid. Mix with the garlic, eggs, parsley and chives in a large bowl, then add the flour and 1/2 teaspoon each salt and pepper. 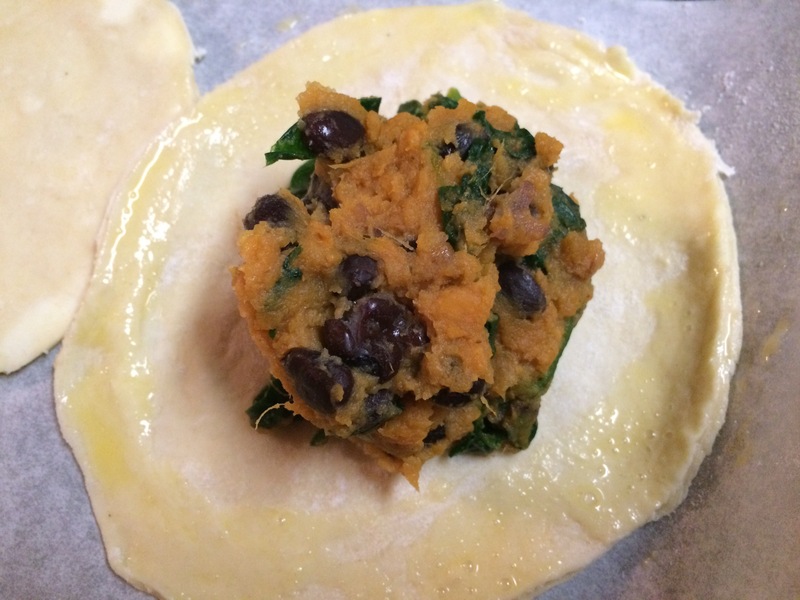 Shape into 12 thin patties, squeezing to remove any remaining liquid as you form each one; lay on a sheet of parchment. Heat 1/4 inch of peanut oil in a large skillet over medium-high heat. 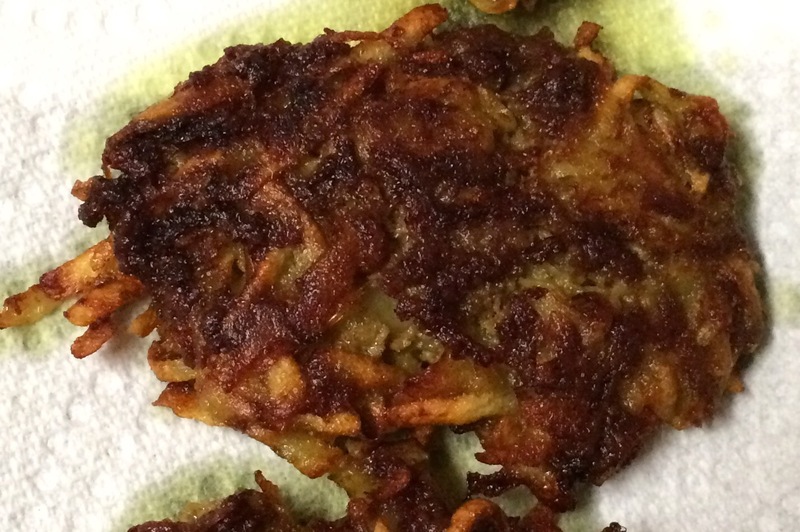 Fry the latkes in batches until golden brown, 4 to 5 minutes per side. Drain on paper towels and season with salt while hot. 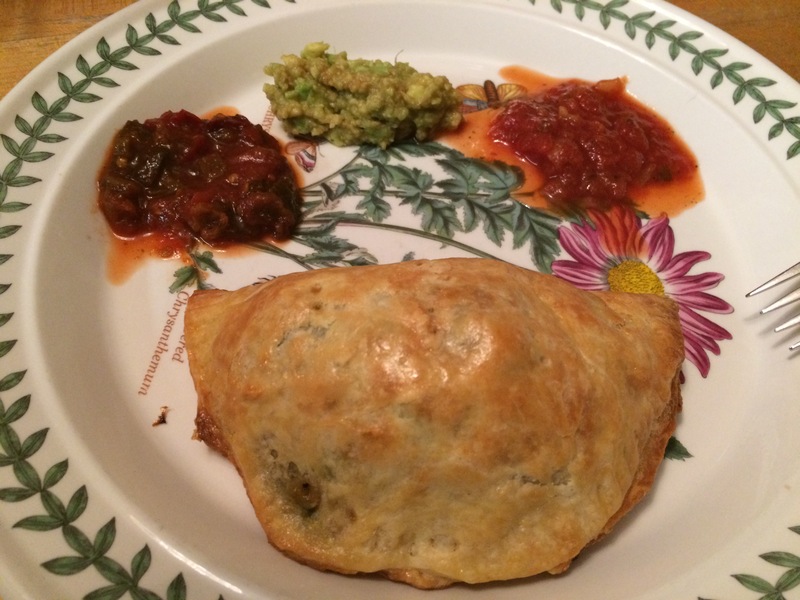 Serve with applesauce and enjoy! 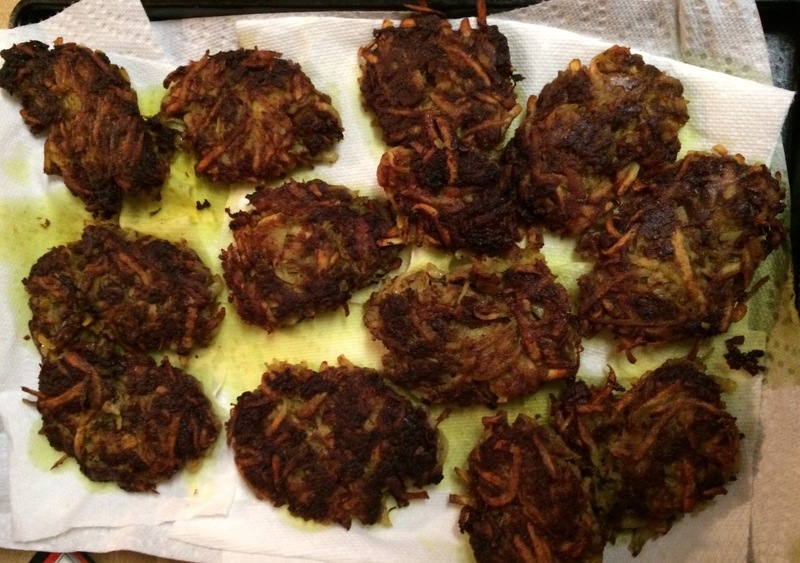 Spaghetti squash latkes, who would have thought? 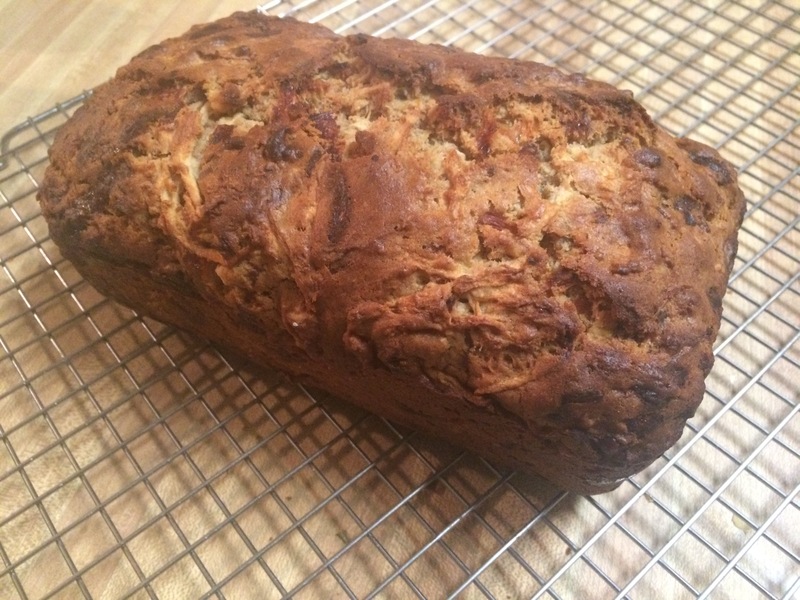 Zakah Glaser, that’s who; and I thank her for the recipe I found on Chabad.org. 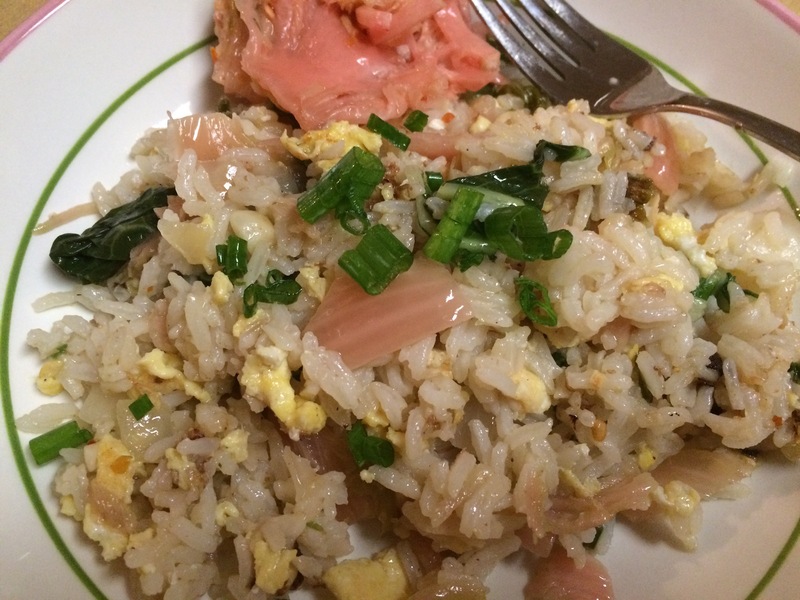 I have to say that these were good the first day, but they were excellent as leftovers. I have no idea why this was true, but that bodes well for making these in advance for a party or other gathering and then warming them up for serving. Slice the squash in half, scoop out the seeds, place face up in a baking pan and bake for 1 hour at 450ºF. Let squash cool, then scoop out squash and mix with remaining ingredients. Coat skillet with vegetable spray or oil and drop mixture by spoonful into pan. Brown well on both sides. Drain on paper towels. I saw this recipe about 10 months ago, immediately pulled it out and set it on my Hanukkah to-do list. Last year I made the menorah shaped challah. 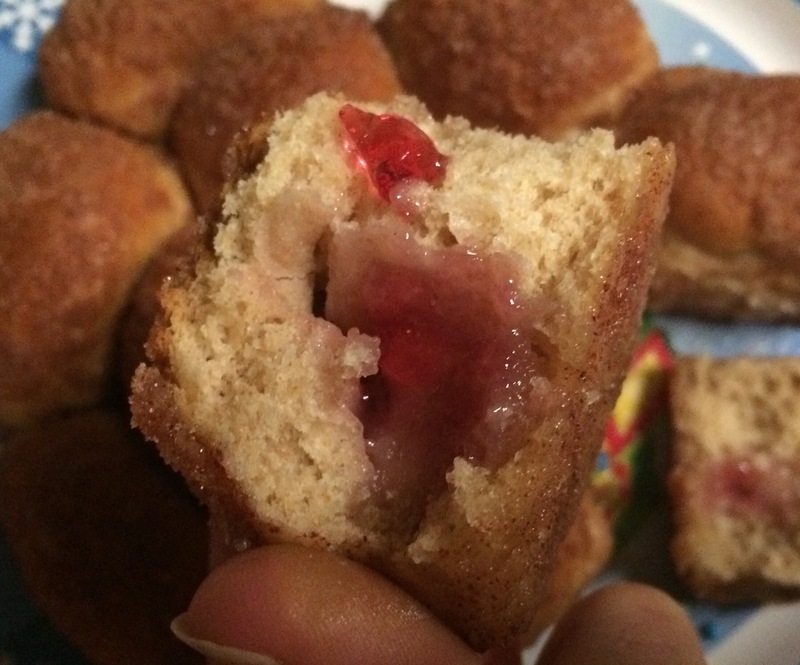 But really, what say Hanukkah more than sufganyot – jelly donuts? 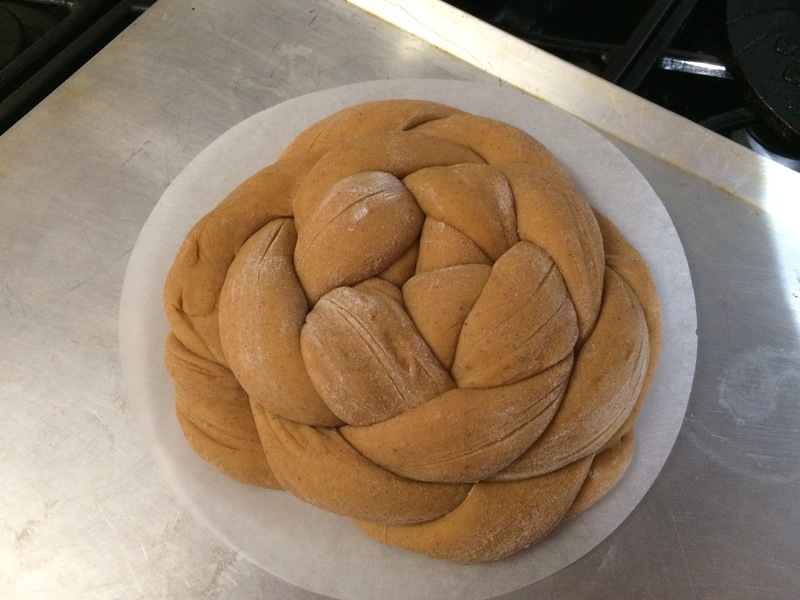 So, what could be more perfect than a jelly doughnut challah?! 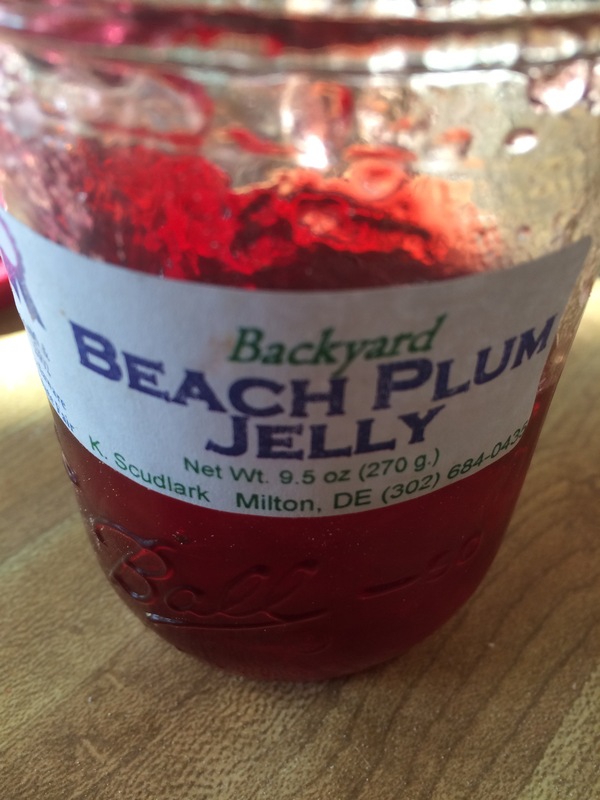 The recipe calls for strawberry jam, but this is Delaware, so I used Beach Plum jelly made by a woman I know (she makes lots of yummy jellies, but the Beach Plum is very special). 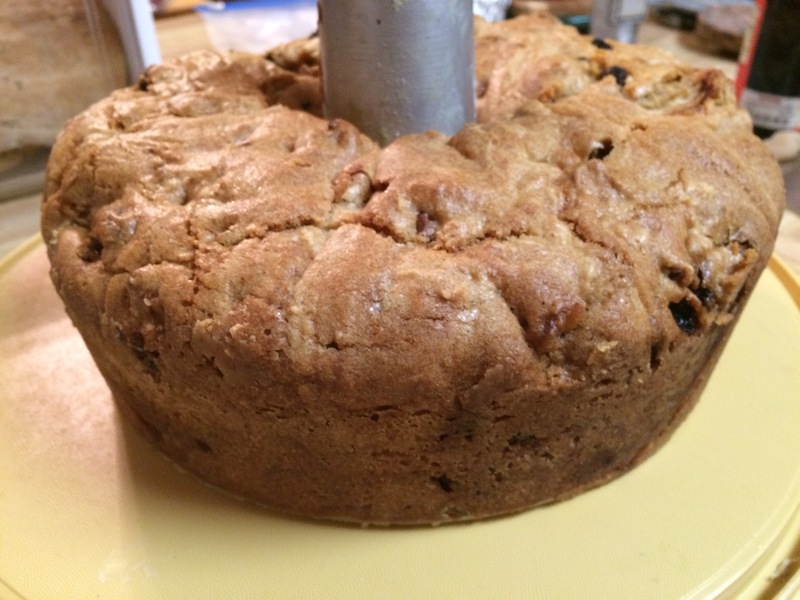 One of the things I really like about this recipe is that it uses 1/3 whole wheat flour. 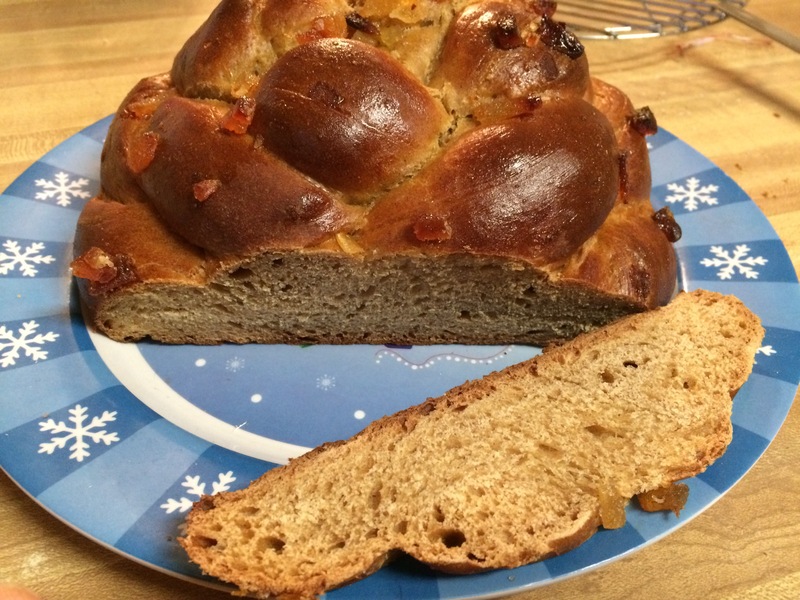 This gives the dough has a little substance, balancing the doughnut-i-ness of the challah. I think this one will become an annual tradition! Using a stand mixer with the dough hook fitted, mix the flours, sugar, salt, and butter. Set aside. Mix the yeast with the warm water and stand for 5-10 minutes until foaming. Add to the dry ingredients and mix until smooth – about 10 minutes with the motor at a low setting. Cover the bowl and place somewhere warm for around 45 minutes or until the dough has risen in size (about doubled). Punch down the dough and tip out onto a lightly floured surface. Cut into 16 pieces. Flatten a piece between your hands, then place about half a teaspoon of jelly onto it and gather the edges of the dough around the jam. Pinch and squeeze the edges to seal in the jam, then roll between your hands to form a ball. Set aside and repeat with the remaining pieces of dough until you have 16 jam filled balls. Place the vegetable oil in a shallow bowl, and mix the cinnamon sugar in another bowl. 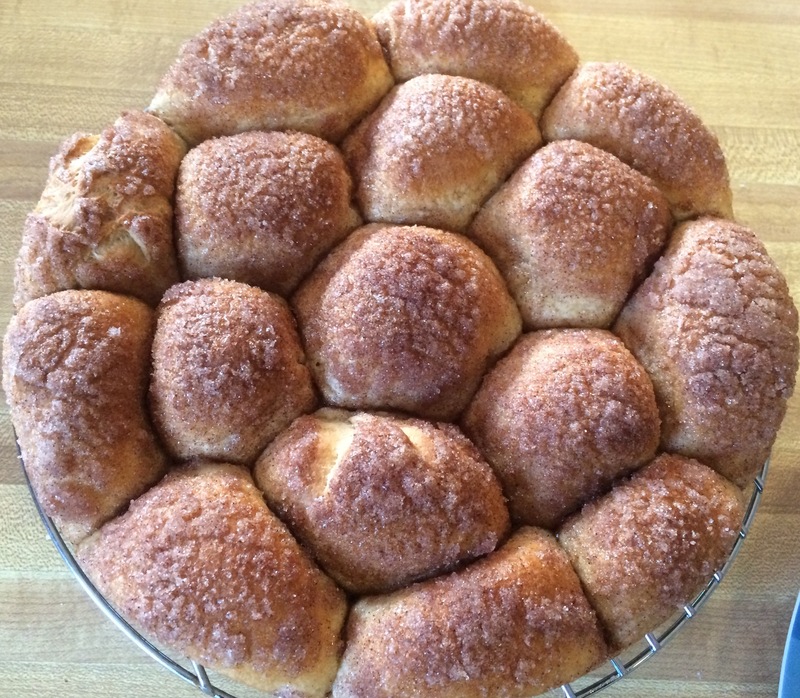 Roll each ball of dough first in the oil, and then in the cinnamon sugar to coat. Arrange the balls in an 8-inch round baking pan. Allow the dough to rise again, for around 30 minutes, or until the balls are doubled in size and there are no gaps between them. Preheat the oven to 350F. Bake the challah for around 25 minutes until it is risen and golden brown. Remove from the oven and allow to cool for a few minutes before removing from the tin. Pull apart, eat and enjoy! 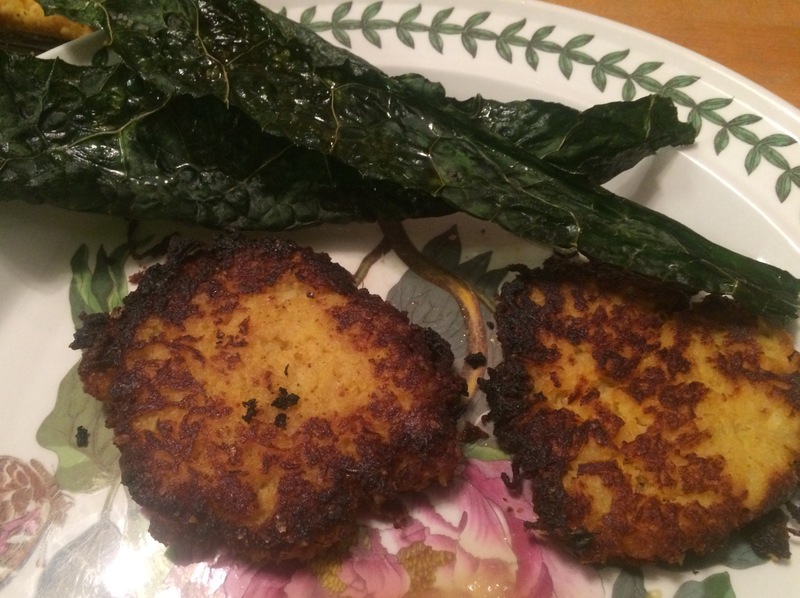 Kotlet Latkes – Persian Beef & Potato Patties turned into Latkes! I really enjoy when I can blend my husband’s Persian foods with Jewish holidays. We found a perfect combination with Kotlets. 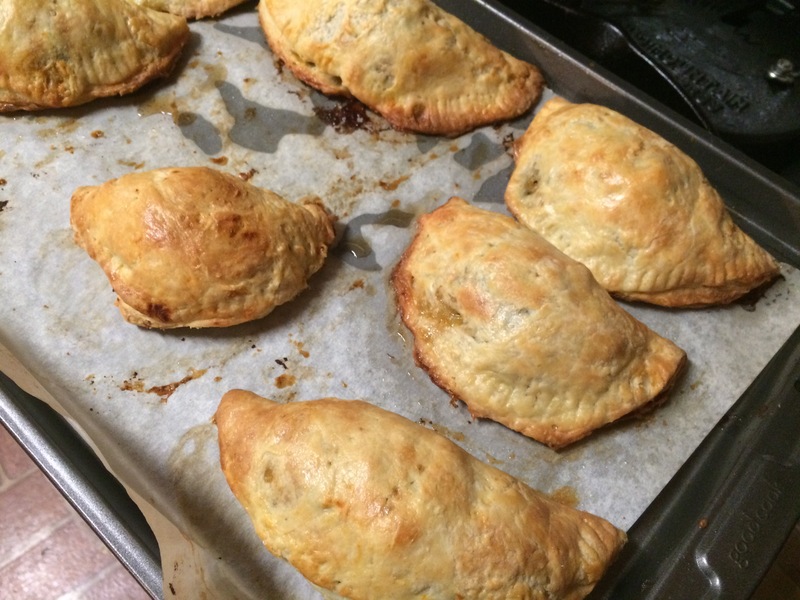 Kotlets are a small beef, potato and onion patty that is fried to crispy goodness. As my husband described them to me, his mom made them with potatoes that were mashed. But I have also seen them with grated potatoes. Next time I will make the mashed potato version, but for our Hanukkah version – grated potatoes it was! I used advieh and turmeric to get the flavor we wanted. If you do not have advieh, cinnamon is similar, but use less of it. We ended up with enough to serve 6 – 8 people as a main dish. It was a fun way to start Hanukkah and celebrate our diverse household. They were gobbled up before I got a good picture of a plate – but we ate them with parsnip fries, cucumber tomato salad and torshi (gardiniera). Peel the potatoes and boil in salted water until just tender, about 8 minutes. Allow to cool until you can easily handle them, then grate the potatoes. Peel and grate the onion, squeeze out the excess water. Mix all the ingredients (except the oil) together in a large bowl. Use your hands to mix them together really well. Form the patties by take a handful of the meat mixture, about the size of a large egg, and form it into a flat oval (or egg-shaped) patty. It should be 1/3 – 1/2 inch thick. Repeat until all the meat mixture is made into patties. Heat ¼ cup oil in a large nonstick or cast iron skillet over medium-high heat. Brown the patties on both sides, about 4 to 5 minutes on the first side, then about 3 minutes on the other side. 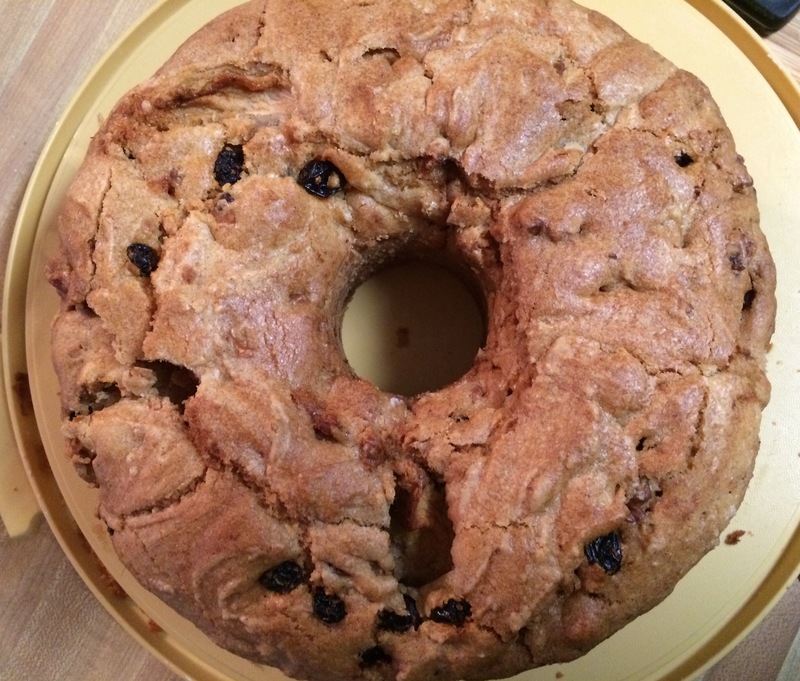 I am on a search for “the” apple cake recipe. 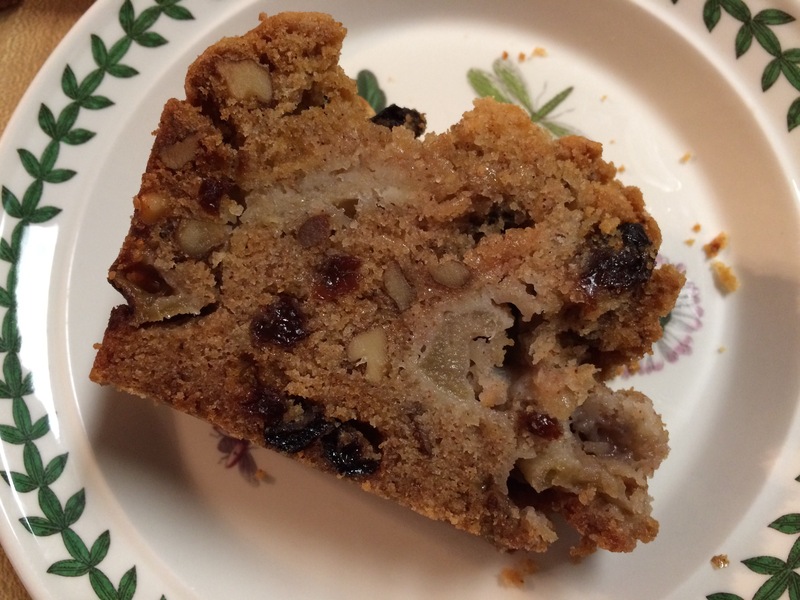 I am still not there, but this one comes close – chock full of apples, raisins and walnuts – it is delicious! It is perfect for Hanukkah, since it is an oil-based batter. That helps give it a crisp outside with moist inside. I love that combination of textures. I think the only change I will make to the recipe is to chunk the apples instead of leave them as thick slices. I think the cake slices may look a little neater. But when it tastes this good, who cares! Preheat oven to 350 degrees. Butter and flour a 9-inch tube pan. Beat the oil and sugar together in a mixer (fitted with a paddle attachment) while assembling the remaining ingredients. After about 5 minutes, add the eggs and beat until the mixture is creamy. Sift together 3 cups of flour, the salt, cinnamon and baking soda. Stir into the batter. 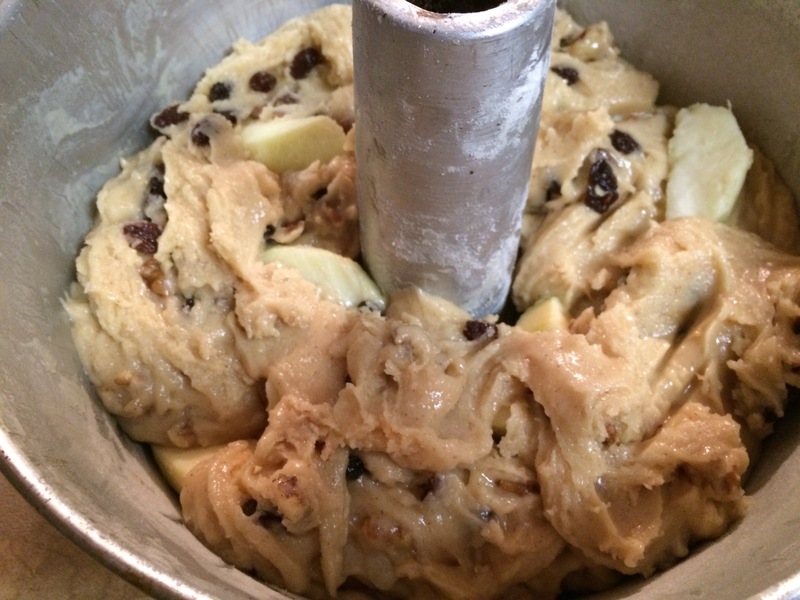 Add the vanilla, apples, walnuts and raisins and stir until combined. Transfer the mixture to the prepared pan. Serve at room temperature (also great with ice cream!). So I could make this bread. I have to say that the final bread was not what I had expected. I guess the flavors melded together because I couldn’t distinguish the flavors of the apples or cheese, or even the nuts, which really surprised me. 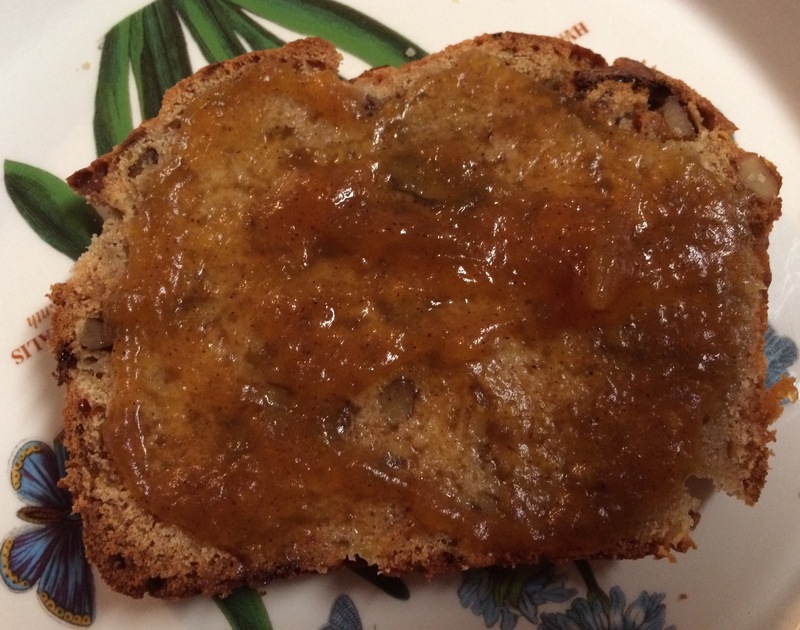 But what I did get, was a very moist, satisfying bread with a nice crust that went great with my daughter’s pumpkin butter. Preheat the oven to 350°. 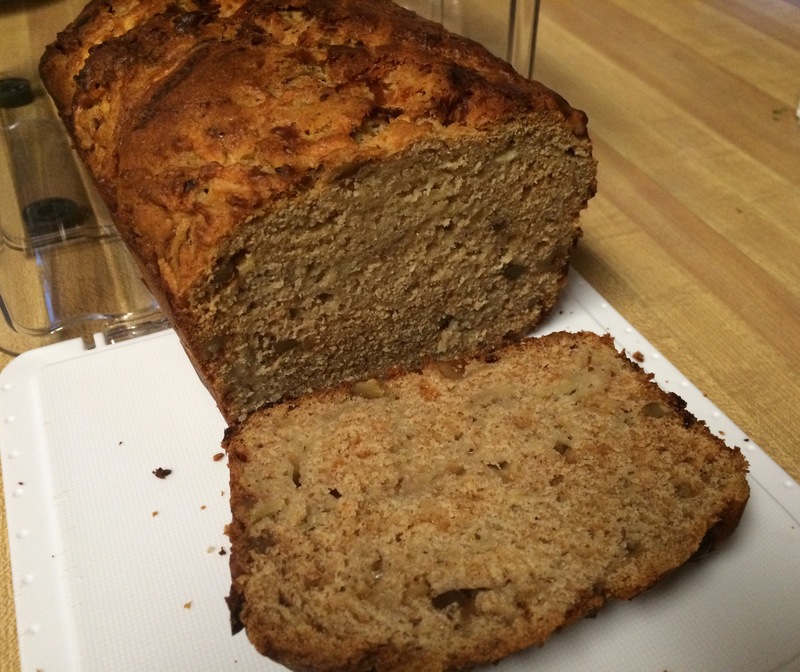 Lightly grease a 9 by 5-inch loaf pan. In a large bowl, cream together the butter and sugar until light and fluffy. Beat in the honey and eggs. In a separate bowl, sift together the whole-wheat flour, all-purpose flour, baking powder, baking soda, spices and salt. Add the flour mixture to the butter mixture and blend until just combined. Fold in the apple, cheese and walnuts. Place the pan in the oven and bake for 50 to 60 minutes, or until a toothpick inserted into the center of the loaf comes out clean. Turn the loaf out onto a wire rack and let cool completely.